Remember that with cycling, what goes around comes around. An apt phrase to describe the resurgence of the two wheeling experience in Ontario. 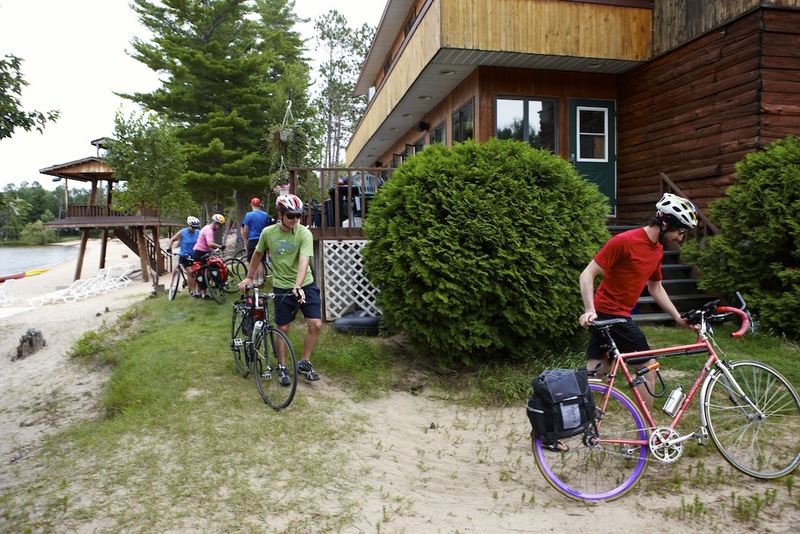 Everyone’s getting into cycling and nowhere is it more popular than at the cottage. My cycling resurrection was prompted by exercise, fresh air and low cost. The motorized alternatives are simply too expensive. Also, that would mean more machines to lug around for service. Besides, I wanted to be self-motivated for a change. The wife wants to know what I’m on. More than that, I couldn’t shake the notion that too much of our fun depends on internal combustion these days. The wife asks why men find primitive noises so amusing? What are we teaching our kids? That lakes can only be enjoyed skiing behind a fast boat? That communing with nature requires an ATV? What happened to smelling the roses? Allergies, says the wife. Bee stings more likely. Not that I have anything against engines. I have my share. They have made recreation more accessible, interesting and available. But they are not the only way to recreate. The wife says she wondered if I’d ever notice. Besides, I needed more exercise. The years have resulted in some nether region torso slippage. The wife says more like a landslide. A matter of perspective; I can still see my shoes. Cycling also appealed to my sense of adventure and youth. Or what’s left of them. Memories of whisking along with a fresh breeze in my hair. Of having clean air. Or even hair. Remembering demon-like pedaling down steep hills. Walking up. But the urge to conquer them still lingered, so I bought a mountain bike to test the name. As a born again biker, I can testify that the new mountain bikes or their hybrid cousins, the all-terrain bike, are vastly superior to anything I ever rode as a kid. Even better than can be found in the dump. For neophytes, they offer safe handling, easy operation, and a more upright ride than racing cycles and good stability. By spending about $500, I acquired sufficient quality for my Tour DE Cottage. But no technology has impacted bicycle seats. They are still the most uncomfortable place to settle a derriere. Hardly better than no seat at all. The wife says I need a double extra large. I’ve already got that. What I need is a comfortable place to put it. I tried seats that were widened, gelled, foamed, aired, cushioned, padded and pumped. I tested cycling shorts the same. I tried cycling standing up, changing angles, and alternating cheek to cheek. I even tried a whoopee cushion that made rude noises as I rode. Or so I claimed. Like any popular sport, cycling has a lucrative after-market of accessories, apparel and gadgets. For casual riding, most are unnecessary. Except for the horn, bell or whistle mandated by the Highway Traffic Act. And of course, a helmet. But for more ambitious country day trips, I carry water bottles, cycling gloves, storage packs, tool kit, and wallet. I wear an orange reflective vest. And yes, I am magnificent in skintight (if only the skin was!) cycling shorts, albeit covered by very long shirttails. The wife says I remind her of a shy gal in a too-short-for-comfort mini skirt. Just trying to limit the exposure of my double extra large, honey. My cycling success prompted me to involve the wife. Something we could do not yelling over engine noise. Here’s a hint guys: ask first or all you’ll be doing is accumulating junk for the next garage sale. Undaunted, I wanted the wife to enjoy her debut ride. Which meant a bike at least as good as mine. But then I remembered a forgotten canoe, a neglected paddleboat, an unused tennis racket and a forlorn stair climber. All top of the line. All gathering dust. Not to mention cross-country skis, snowshoes, and a fishing rod. And the tummy-sizer, abdo-worker and video workout library – all testimony to good intentions gone bad. Mine mostly, so I hedged and bought down. To date, the wife’s bike has racked up hours of shed time. But I’m unperturbed because it wasn’t costly. Maybe if it had been, she’d be riding with me today. I can always dream. But I could sure use a push to the top of the hills.